The Northern Lake County Quilters Guild (NLCQG) is an organization of enthusiastic quilters from northeast Illinois and southeast Wisconsin. We meet monthly in the Antioch, Illinois Township Center. In addition, we have workshops presented by nationally known teachers, special events such as local shop hops and UFO days where we gather to work on our unfinished or charity projects. If you enjoy quilting, we hope you will consider joining our guild! Learn more about our upcoming events by reading our blog. Please join for a meeting on Wednesday, May 1st, where Jane Reents will present the program “Love of Paper Piecing”. Doors open at 6:30PM, meeting starts at 7:00PM. This workshop has been cancelled. 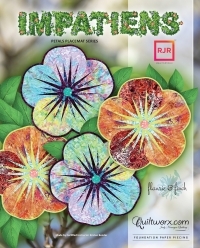 On Saturday,May 4th, Jane Reents will teach the workshop “Impatiens Placemats”. Please join us for a fun and productive UFO day at the Antioch township center from 9 AM to 4 PM where we sew and make new friends.